Yearly budget by template and calendar. Support multiple budget versions. Create by template, auto fill per pre-set rules, notification of new schedules and updates. Employee can pickup, drop or trade their schedules. Check in and check out from website or mobile app. Track start, stop and break time. Realtime compliance and overtime monitoring. Cost report by budget, template and actual timesheet. 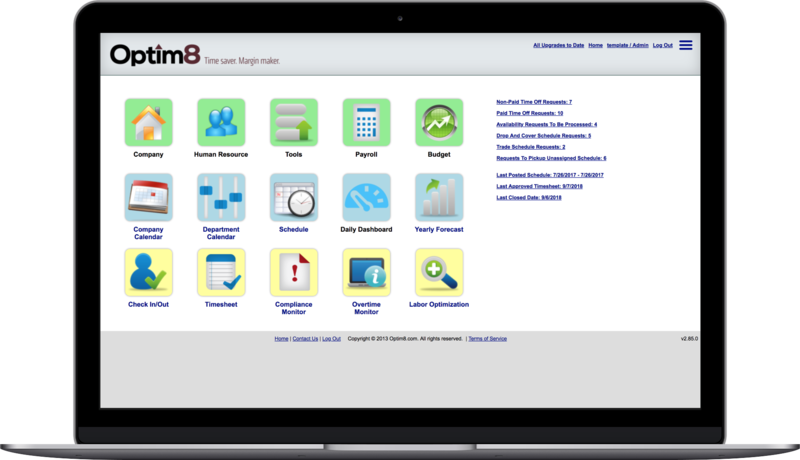 Real time tracking of overtime, real time cost report and forecast. Define compliance rules base on state and local labor rules. Validate schedule and timesheet. Real time compliance monitor. Free iOS and Android app to view and update schedule, check in/check out, view timesheet, submit time off request and receive notifications. Spending countless hours completing manual schedules or updating a spreadsheet? Having trouble or just don not have the resources to track overtime prior to it occurring? Being over budget on labor costs and trying to determine why? More than a time and attendance tool, our affordable web-based system helps you optimize the deployment of your labor resources. Intuitive screens allow you to easily forecast staff and budget requirements, automate employee scheduling, track overtime in real-time, monitor accrued time off, and comply with local, state and federal workforce regulations. If for any reason you’re not satisfied with our service, simply e-mail info@optim8.com during your first 30 days and we’ll refund your money, no questions asked.